In this blog post, we have come up with the best th10 base War, Farming, Hybrid, and Trophy designs 2019. We are going to cover 5 designs of each category like war, farming, hybrid and trophy of 2019. for more tips, tricks and attacking strategies visit here. 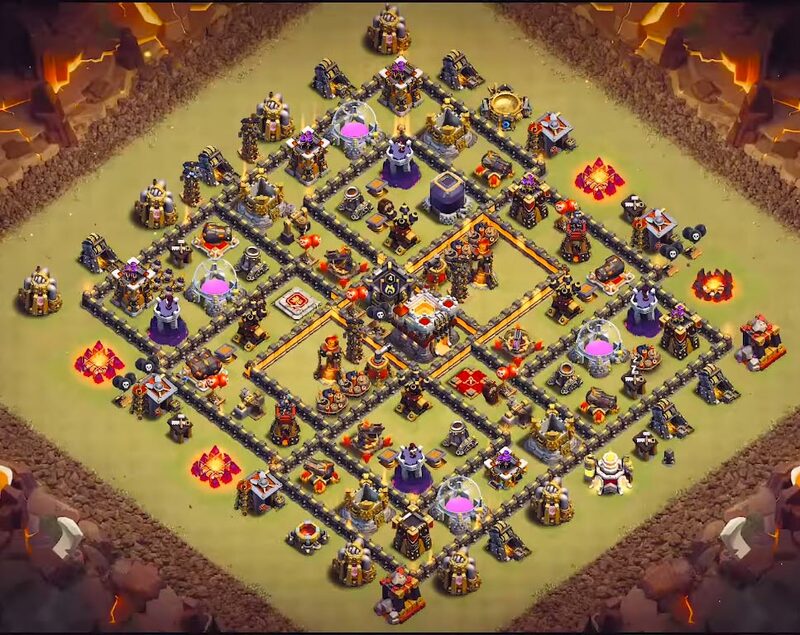 5.2 What makes this clash of clans design an anti valkyrie and golem layout ? As you can see the first best th10 base with town hall centralized in the core surrounded by Tesla’s and Inferno towers. This a particular pattern of layout where in the defensive structures like wizard towers and archers towers are fixed in their positions in the design accordingly. The dark elixir storage is placed close to the town hall so before attackers go for town hall he needs to take down the high point dark elixir storage first which takes a considerable amount of time. In the mean time, the surrounded defensive takes down the enemy troops. If you look at the bottom hand side the first inner compartment is huge make the troops go way around rather than entering into the village. how to download clash of clans for android ? 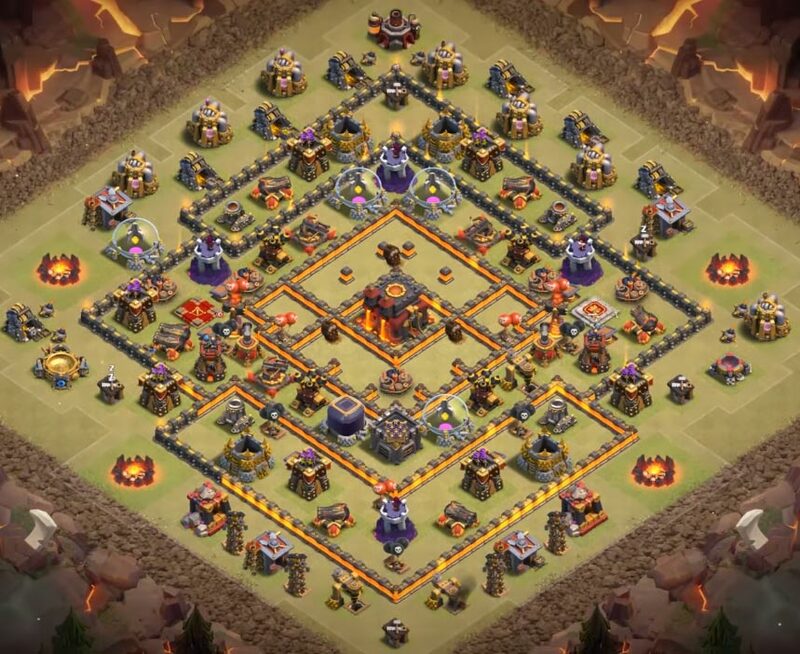 This is an another best th10 layout having unique construction that can save 2 stars in clan wars, so that makes an anti 2 star th10 layout. 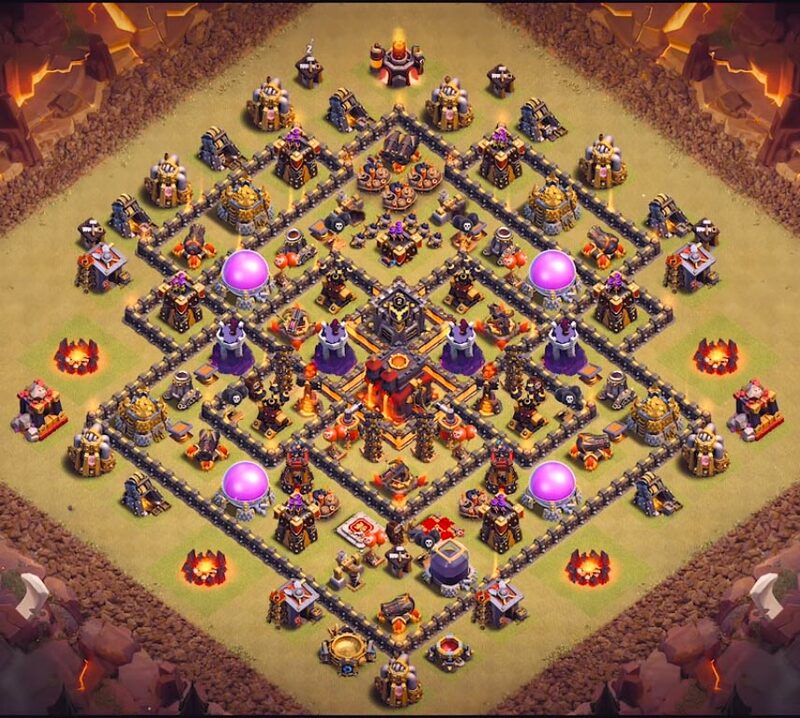 This th10 layout design can also be used to protect trophies. 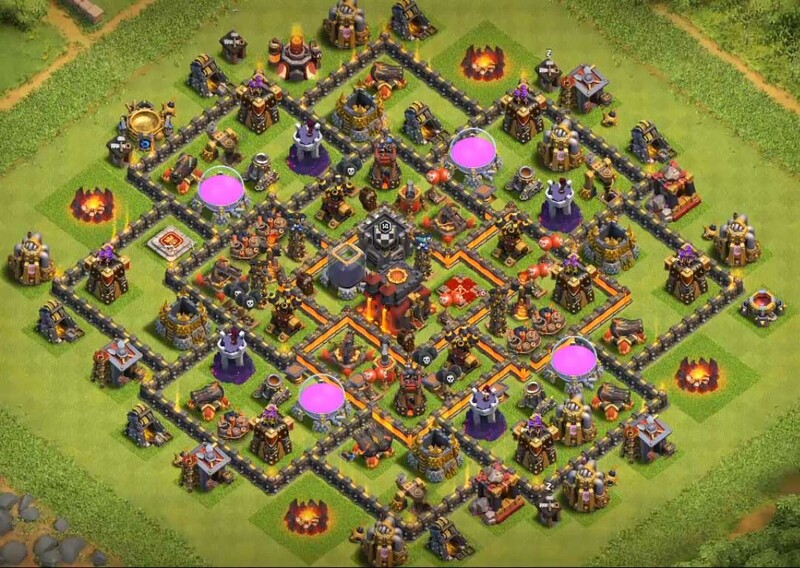 This is another coc town hall 10 village having a boxed design to protect your stars and make your clan win in clan wars. we have included one double giant bomb in the core of the village to protect this layout from hog rider attacks. Ground mainly (Golems, valkyries , hog riders). Air (Lava hounds and Balloons). This is an really interesting level 10 with geared cannon. what makes this design different among all is the construction itself. 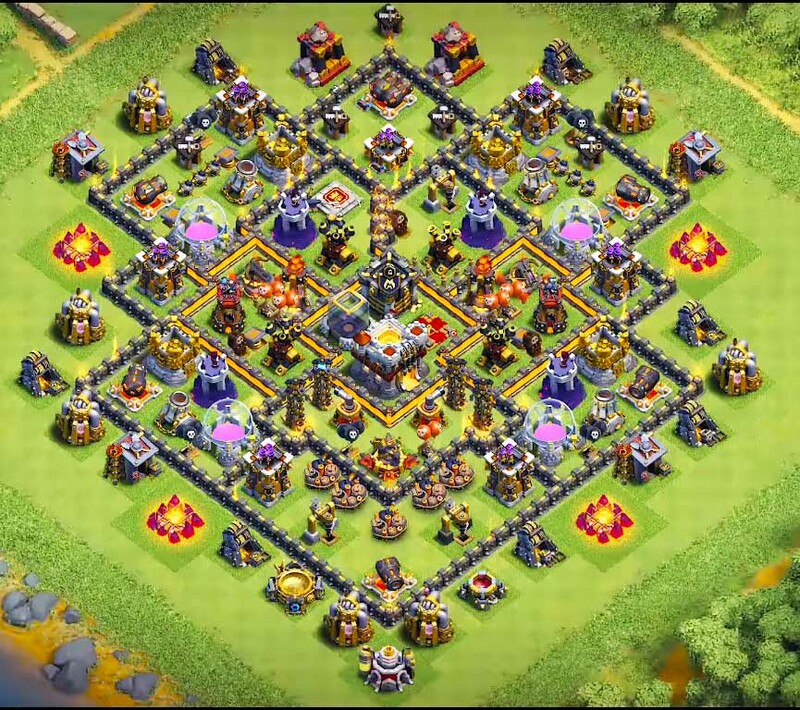 This is one gem of layout which can be used in wars to protect stars and eventually save your clan. As you are already enjoying with the great collection of town hall 10 map. we are here with one more design that is uniquely constructed. The best thing about this town hall 10 map design is having one to many compartments that makes it really harder for ground troops like golem’s and valkyries to reach the inner core.One more thing is double ring in the center of the layout that makes troops to go over all around the layout except the main area where town hall 10 map is present. Golems, Valkyries, Bowlers, Witches and Lava Hounds with combination of balloons. so here we are up with the best town hall 10 designs of farming. the town hall 10 layouts we are going to have a look at our unique and can protect loot in multiplayer battles. 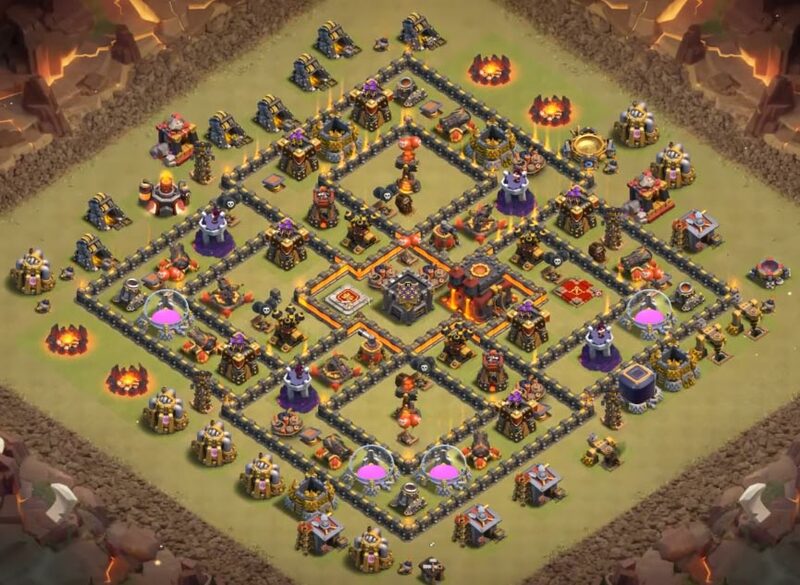 so coming to the first layout, the dark elixir is centralized surrounded by infernos and Tesla’s and town hall th10 which are having high hit points and that takes a considerable amount of time. 1. Giants 2. Valkyries 3. Barbarians and Archers. 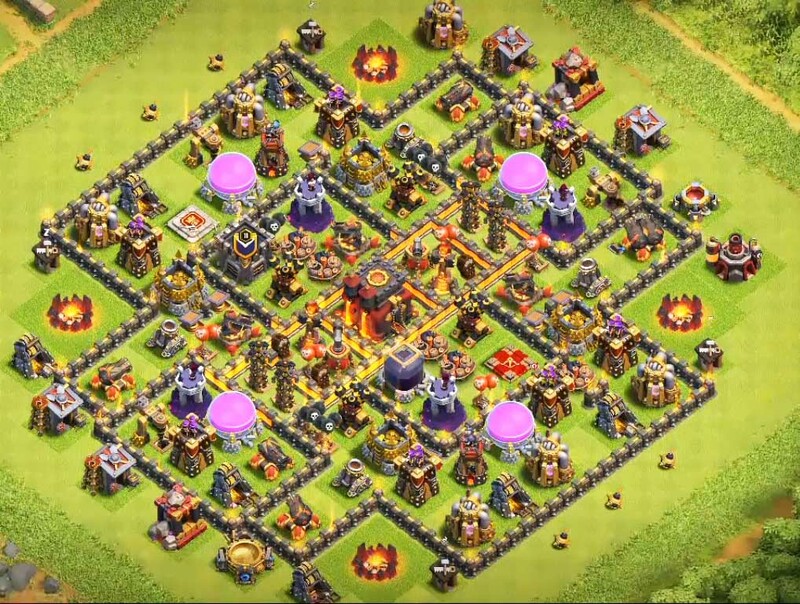 There are four outer compartments for this town hall 10 farming layout which are composed of gold and elixir storage’s with some defensive structures such as cannons, wizard towers, and archer towers. the compartment which is right next to the outer compartment is composed with air defenses to over the air troops such as balloons and dragons. 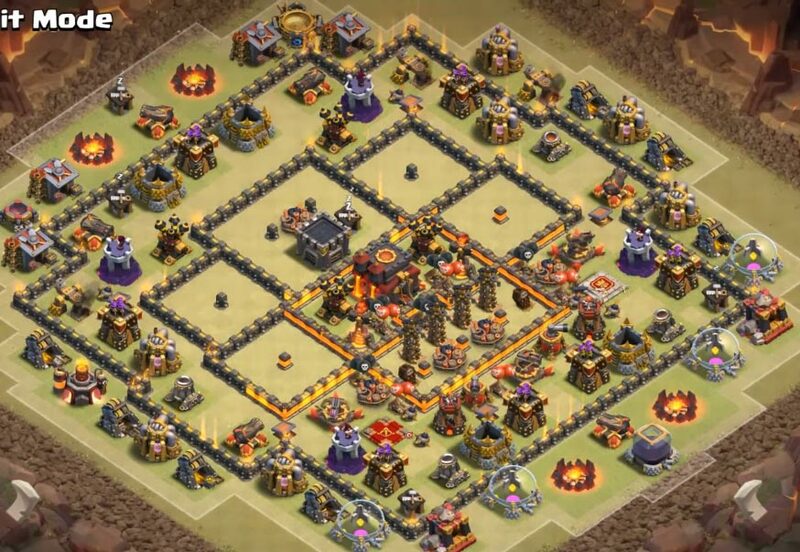 the above coc th10 layout has great construction of walls along with evenly distributed defense buildings. This a donut having double ring in the core of the layout. 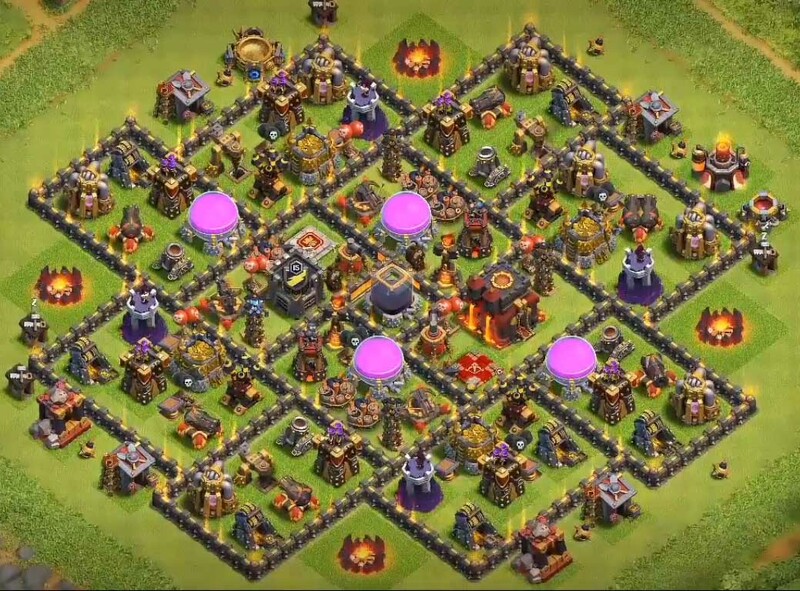 This level 10 layout has tesla’s surrounded around town hall and dark elixir . that makes this th10 dark elixir farming. Do remember that we have used only town hall 10 buildings. The first hybrid layout has the unique construction of all. the town hall 10 is placed in the center of the layout. This fully compartmentalized th10 layout can be used for both wars and multi player battles. In wars this will be good at defending ground army very well. well this makes an excellent town hall 10 with 2 bomb towers . the best thing about this layout is it can protect your loot very well. You can see four of the storage’s in the center of the village in paralleled compartments. The only thing we look at while designing trophy design are how to protect as many trophy as we can. Well you should remember the sole focus here is to save trophies. one more best thing about town hall 10 designs is this designs can also be used for wars to defend various attacks. 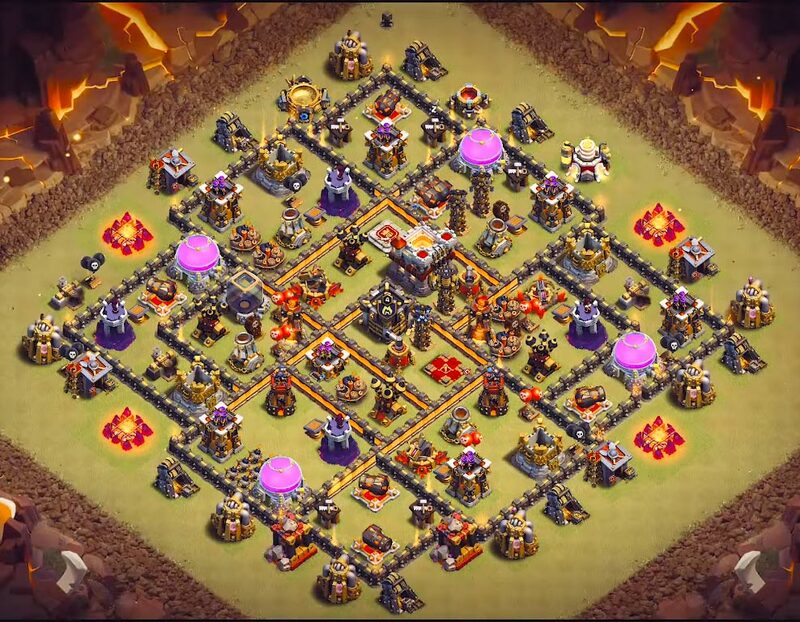 This is an ring best th10 base in the world . It specializes in protecting trophies by taking advantage of the troops directions. So, when an attacker deploy’s their level 10 troops then they scatter every where across the make it easier to save trophies. 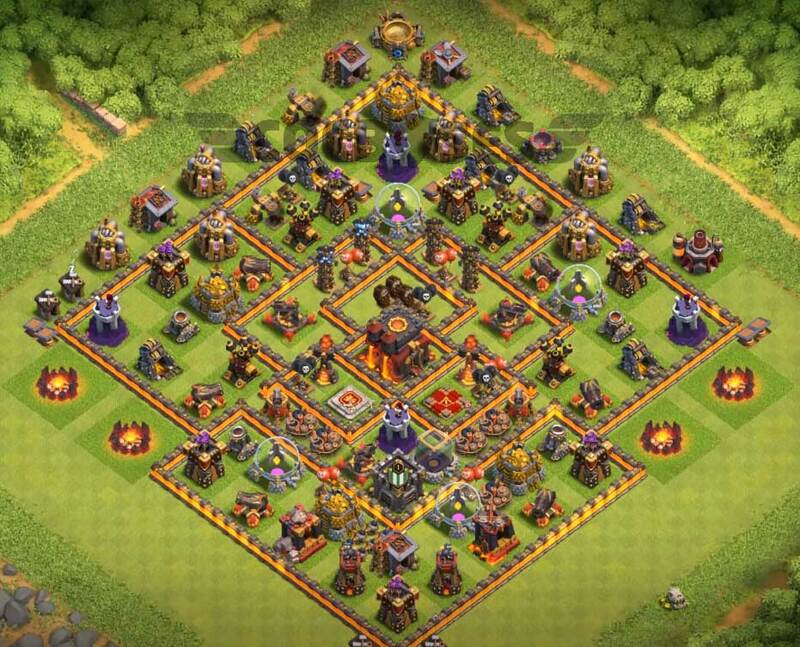 What makes this clash of clans design an anti valkyrie and golem layout ? Basically, as already you have seen the construction of this map you can conclude that this design is really good for ground attacks. especially golem’s, bowlers and Valkyries, but make sure you max out your walls, because that plays a crucial role in defending ground attacks. but the bad thing is it might be vulnerable to miners because miners are crazy tiny creatures that by passes walls by mining into the ground. but you shouldn’t worry about them too much because we also got it covered with the heavy concentration of defensive buildings across the town hall 10.
what an excellent collection of bases. keep up the good work 🙂 . I’m regularly assaulted by bowlers. I incline toward air troops for protection, cause now and then they split (hard to harm), and in some cases the ruler sets aside some opportunity to murder them. A few players even spend their stop attempting to stop my infant drags and flunkies. A golem can keep bowlers occupied for quite a while, however the bowler will crush different structures (for the most part in the center) while killing the golem, since the stone skips 2 times. On the off chance that there are any th10 players pushing through Titan to legend I might truly want to know whether anybody has any guarded wins. I have made it into Titan 2 group yet attempting to remain there and 1 protective win this season, my format was the hourglass plan and mythical beast and nut cases in CC killed his valks before ruler arrived and fizzled with 32%. In any case, have not seen whatever other and thinking about whether anybody has a hostile to valk and against bowler base plan that has gotten them even 2 or 3 guarded wins. In Titan 2 it’s just been mass bowlers or valks assaulting me. The battle is genuine individuals lol upbeat conflicting to all, and merry Christmas . The TH9 DE ensuring base was 3 featured 5h after i duplicated it by a low level armed force while my past and old DE securing base was 70% max since the bomb tower fix ….. So it’s an absolutely must base …..
I’ve really begun lavaloon with ruler walk tidy up,,, as yet tinkering with it,,, just began doing walk on the grounds that my th8.5 gift account doesn’t have magma or high lvl nut cases yet. Be that as it may, I can give max healers. I’m having great outcomes for a 3 week old th10,,, 1 camp done 3 updating now so I’m down 15 troop spaces,,, magma scurry still just lvl 2 th9 lvls. Get the odd 3 star,, however generally high % 2 and 1 stars which I’m fine with,,, I get my favored plunder in addition to full class reward. Right now 3 magma 20 nut case 2 healers 3 breakers 1 curve 3 seethe 4 scramble 1 harm,, in addition to 2 healers 3 flunkies 1 curve 1 harm in cc. Both ruler lvl 30. Have utilized 4 magma 21 crackpot 3 seethe 4 scramble 1 harm, followers in cc from gifts account or fifth magma if colleagues on the web and toxin.. Both armed forces great achievement,,, ruler walk can spare the day and get 1 star if something turns out badly with air so I’m utilizing that all the more right at this point. With respect to safeguard I’ve changed xbows to air,, in addition to my skeleton traps,, just have 1 inferno while other one is redesigning,, got that on multi,, not certain what I’ll do when both maxed. Wiz towers far from advertisement so not occupied by magma,, and looking for bombs by promotion,, air bombs by wiz or far from way to advertisement. Still I’m getting nailed by max th 11’s constantly. So very little I can do about it. This games I very good. I design bases which will surely win trophy of any th except 11. 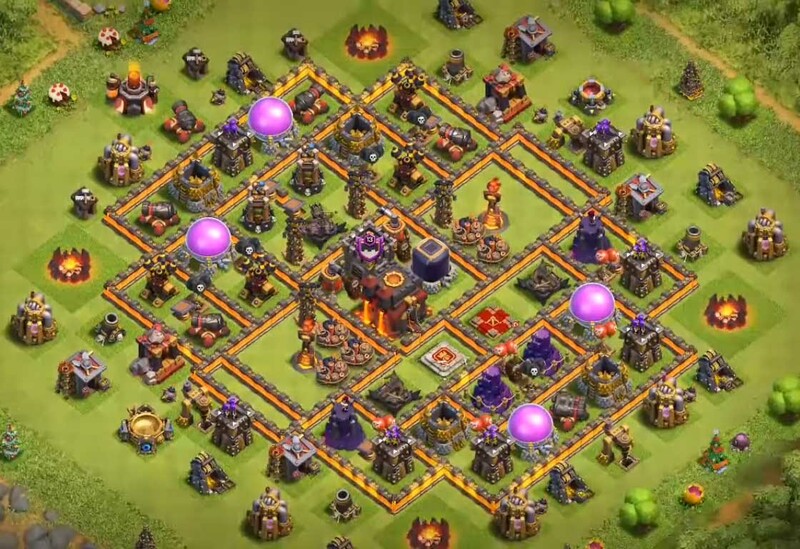 How can I submit my base design?Its a th10 And has held up against everything thrown at it so far.